The existence of Saddam Hussein's weapons of mass destruction has been verified by many sources that liberals would normally find unimpeachable, including Saddam himself, the United Nations Monitoring, Verification and Inspection Commission, and now, WikiLeaks. Still, the media continue to ignore the latest WMD revelations, even while hailing WikiLeaks founder Julian Assange as a heroic whistleblower. The WikiLeaks documents pertaining to Iraq debunk the popular conception that the search for WMDs has been a wild goose chase. Instead, they tell how our soldiers have continued to find chemical laboratories, small caches of chemical munitions, and enemy combatants who specialized in chemical weapons, as recently as 2008. This information had actually not been released in the days leading up to Assange's arrest, but had instead been in the previous document dump, in late October. At some point, the Iraq War will be studied by historians who aren't politically invested in the issue, and they'll wonder what could have ever made such an advanced society so gullible and obtuse as to believe that Saddam had no WMDs, just because massive stockpiles hadn't been found. * A defense department report detailing the finding of more than 500 sarin and mustard gas bombs and warheads between 2004 and 2006. * The discovery of drums full of potentially deadly dual-use chemicals, in a camouflaged ammunition dump. * The discovery of empty binary warheads, specifically designed to blend sarin gas while in flight. 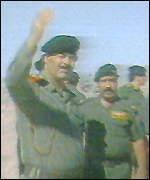 * Repeated attempts by Saddam's officials to obstruct, misdirect and bribe the weapons inspectors. * The concealment of WMD components among the civilian population, as evidenced by the centrifuge buried in the yard of one scientist, and the vial of botulinum toxin in the refrigerator of another. * The removal of 500 tons of uranium from Iraq by the U.S. military. * The weapons inspectors' finding of WMD-related purchase orders and progress reports, as revealed to Tom Brokaw by chief inspector David Kay in 2003. * A 2004 UNMOVIC report to the UN Security Council, explaining that Saddam had kept dual-use equipment capable of producing chemical and biological agents at missile sites around the country, and that these sites had been swiftly dismantled and moved before and during the invasion. * One of Saddam's secret audiotapes, dated no later than 2000, in which he and two of his scientists discuss a new method of uranium enrichment. * One of Saddam's secret audiotapes, in which he daydreams about Islamic terrorists attacking the United States with chemical or biological weapons. * One of Saddam's secret audiotapes, in which his son-in-law brags about how completely they had deceived the weapons inspectors about their chemical weapons program. * The new WikiLeaks evidence, which reveals that all has not been quiet on the WMD front as we'd been led to believe. When it comes to Saddam's WMD, no amount of evidence is ever enough. Even if large stockpiles were discovered at this point, the media would dream up some excuse to dismiss them, and most people would just nod along. No proof seems to be necessary, on the other hand, for the naysayers. Take, for example, the Duelfer Report's unilateral destruction theory. In a moment of panic in 1991, Saddam supposedly rounded up all the WMDs in the whole country -- without being detected by the weapons inspectors -- and brought them to a single location, where they were blown to smithereens by a couple fighter planes -- again without being detected by the weapons inspectors. Then there's the one about how Saddam bluffed the whole world so that he wouldn't appear vulnerable to the Iranians. This tale presumes that all the evidence was fabricated for public consumption. But what about all the documentation that would never have come to light until after Saddam was already overthrown? Falsifying those documents would have done nothing to further such a ruse. Nor did he need them to trick his own people. Being a dictator, he answered to nobody anyway. … And if those theories aren't outlandish enough, the next one will have to be that Julian Assange is part of the Vast Right-Wing Conspiracy.